PartyPoker are one of the oldest and most established online poker rooms in the world. Their iOS/Android poker app supports real money Texas Hold'em ring games and high speed FastForward poker on Apple tablet computers and iPhones. Compatible with EVERY type of Apple/Android device. Welcomes players from New Jersey in the United States. Compete in mobile Sit & Go tournaments on your tablet. Hundreds of real money Texas Hold'em tables available. 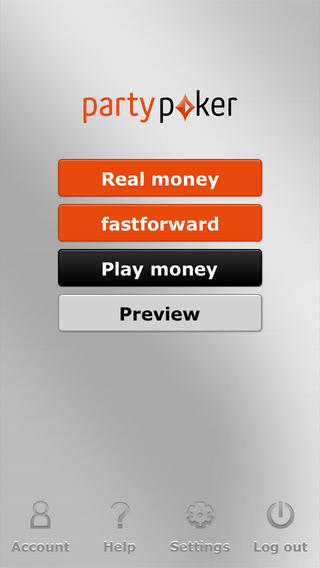 Enjoy their "FastForward" Fast Fold speed poker games. Party Poker has been one of the leading names in the poker industry for over 15 years. The company’s name is now synonymous with online poker and they were widely regarded as the poker room of choice for most of the elite online players in the world for a number of years. Like many poker companies however, in 2011 Party Poker went through one of the biggest mergers in the online poker industry as they teamed up with Bwin to provide a series of sports, betting, casino, bingo and, of course poker, to its punters. It’s been these constant strives for improvement and innovation which has seen the company develop and release their first fully functional poker app. Initially the app was released in December of 2012 but only for Android users, now the integration onto iOS devices, most notably the iPad for this review, has once again allowed Party Poker to develop into becoming one of the leading names in the mobile poker industry. 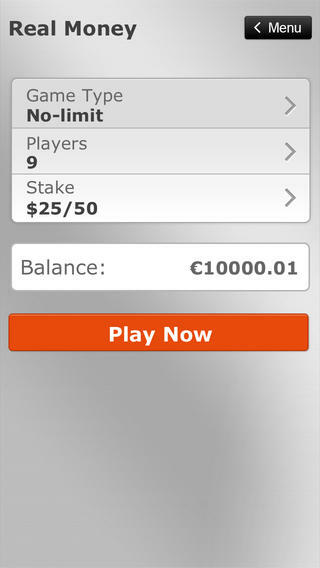 In 2014, PartyPoker were one of the first online poker rooms to win a license that permits them to offer both online and mobile poker in the New Jersey in the United States of America. If you don't live in NJ you can still play real money poker at any of these USA iPad poker sites. A lot of you reading this review will likely be familiar with the name Party Poker. In fact, many of you will have played on the site at some point in your poker careers. But, for those of you that haven’t checked back on the site in a while or for those that simply just has never played on Party Poker, then you may not be aware that they have just undergone a massive re-vamp in terms of design right across the board. The colours, looks and feel that have become synonymous with the company have been ditched for fresh, modern and much more exciting chrome, orange and black colour scheme. As part of their new design, it was always going to be that eventually they would enter the world of mobile poker and it’s this design that has been incorporated by the mobile app. It looks fantastic on the iPad screen and – although we can’t actually confirm this from Party Poker – it does look as if it’s been designed around the Retina display models as opening up versions on both the iPad Air (Retina) and iPad 2 (none Retina) definitely shows a significant difference in appearance. 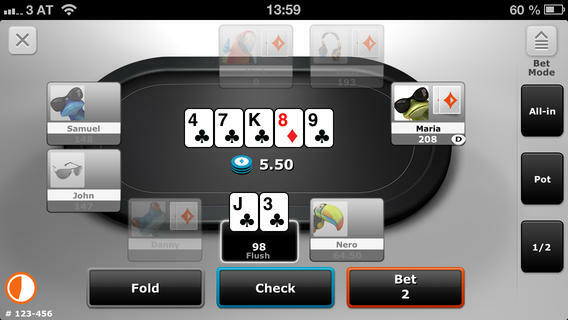 The menu on the Party Poker app is pretty simple, but it’s really hard to get away from how good even this section looks. You get a series of options before getting into the sections such as account information, help, settings and a log out section. It’s probably advised to have a quick look through these, especially settings, before sitting down as you can edit between things like auto post blinds, four coloured deck, sound and even vibrate alert when on silent. Once you are happy with this section the games allow you to choose between real money iPad poker tables, Sit and Go tournaments, fastforward, play money and a preview button. The preview button is a feature that we have seen before on other apps, but it’s a brilliant way for people new to the app to get a look at how the tables look, feel and perform as well as checking out features that are possible whilst sat at the table. The preview basically consists of around a 1 minute interactive video that shows and plays through a hand of poker just as it would whilst sat at the table. The Real Money games are reasonably well covered but at the time of writing the only game on option is Texas Holdem. That being said you can vary this between the amount of players at the table which includes heads up, 6 max, 9max and full ring. A great range of stakes are also on offer which again ranges from 1c/2c all the way up to $25/$50. What’s a big downside in this section is the inability to see which games are running and even how many games that are running. You simply whack in your game type, players and stakes before automatically being sat. This is definitely going to be the fastest route to get into a game, but if its table selecting you’re after then this becomes pretty tough to say the least. Also, there is no real way to see how many games are running, so we can’t comment on how popular the app is yet. The fastforward function is basically Party Pokers attempt at speed poker (or rush poker). It’s one of the more popular formats at the minute that allows you to instantly fold your hand, be moved to another table and then be able to make your next decision instantly. These games can only be played out in two forms of heads up or 6 max tables with stakes ranging from 2c/4c to $5/$10. The tables are where this app really stands out. They just look absolutely stunning! In fact, they are possibly the best looking mobile poker table we have ever come across, and that’s about as big as compliment as we can pay, as we have certainly tested plenty to know what works and what doesn’t. We mentioned earlier about the increase in aesthetics on the Retina display models and playing the games only backs up what we expected was true earlier in terms of an increase with newer models. The same colour scheme from the lobby – chrome, black and orange – is continued on the tables with the buttons being large and easy to navigate in between. The ability to have some quick snap bet buttons such as 2x, 4x and 10x the big blind make bets easy but on top of that they have included a very responsive slider to bet a custom amount. Each player can also choose their own avatar and the boxes they are situated in never look overpowering or cramped, even on the smaller iPad Mini screens. You are slightly limited in what you can change at the table and in fact, you can edit things such as auto post, four coloured deck and sounds in the lobby if you wish. The pace of the games is really smooth and even playing from a weak 3G signal we found that the connection remained pretty strong whilst on Wi-Fi we found it to be rock solid. When registering a new account at Party Poker you will become eligible to take advantage of two promotions they currently have running. The first is a free £10 when you make an opening deposit of just £10. This amount will be credited to your account in the form of an additional bonus amount. You will need to generate 20 or more Party Points before being able to withdraw this amount. Any withdrawal made before reaching 20 Party Points will void the bonus amount on your account. The second is a similar deal except this time party Poker will match your opening deposit of $10 to $50 100% in the form of a bonus. The bonus will be released in 10 equal chunks of your bonus and must be cleared within 120 days of opening your account. To clear the bonus you will need to earn 8 Party Points for every $1 of your bonus. We were super excited to hear the news that Party Poker was finally making their already Android enabled mobile poker app available on the iPad. For us, the iPad is where the majority of mobile poker will be played, with the increase in screen size and the versatility of the newer iPad’s making it an obvious match. And whilst Party Poker took their time to release their iOS version, we are definitely glad they have! We’ve already gushed over how good the app looks, but honestly, it has to be seen to be believed. Get a Retina enabled iPad to really see the capabilities and it’s really got to be said that the Party Poker app possibly now, sets the bench mark for all other poker apps. 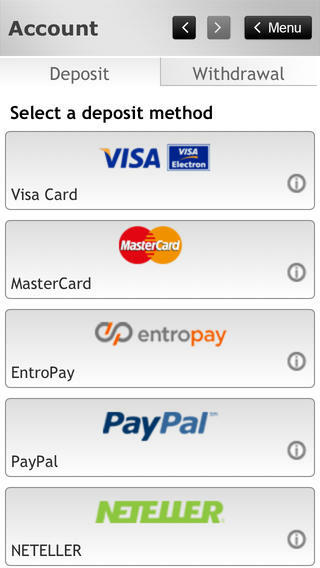 The colours, design, usability, functionality and connectivity of the app all just combine in making it a joy to use. The one downside that we found was the lack of a lobby, which meant you couldn’t really see how many players were online and which games were popular. Having said that, at no point did we not find a game that we wanted to play during our testing period, which was commendable! Overall, you will be hard pushed to find a better mobile poker app than that of Party Poker iPad version, definitely in terms of design at least! Reviews of other top quality mobile poker rooms.